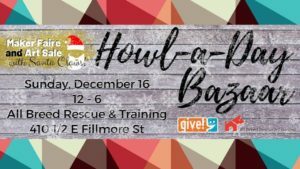 Do some holiday shopping this year at All Breed Rescue & Training’s Howl-A-Day Bazaar! We are partnering with our fellow Indy Give participants to bring you an experience like none other! There will be items for sale for every taste! Your purchases support local non profits and you can shop with your dog!! This is a dog, child and family friendly event! Get your pet’s, child’s or your own photo taken with Santa and The Grinch for just $40 which includes a 8.5 x 11″ print of your choice and digital image of both! We will have free crafts for the kids, baked goods, hot cocoa, and more! You won’t want to miss it!